SLIGHT panic attack as I just typed WEEK 5! I'll admit, I tend to be a procrastinator and work best under pressure, but this one will be cutting it close for sure! This week I feel like I might actually see a tiny bit of light at the end of the tunnel, but there is still so much to do. And, we're expecting stormy weather early next week (no bueno for photographing), so I'm feeling the need to finish even sooner so I can photograph with some light! A few days ago I was finally able to begin putting some things in place. My husband installed the amazing swing-arms that I wrote about in Week 3, got the tv mounted, and I started moving things in. I'm thinking about a few things that will make up a gallery wall around the tv, and am trying to decide between color or black and white photos. LOVE the look of a b&w photo wall (I have one in our Office), but am not sure if that's right for this room. I'll be experimenting over the next few days. Some pillow experimenting is happening here too. This project kept me busy for several days this past week... but it was totally worth it! You just get a sneak peek today, but these are the doors that lead into the bathroom, and they were just flat and black before. There will definitely be more details coming about these in the coming weeks! Sorry, they're really bright white, but my lighting was bad. 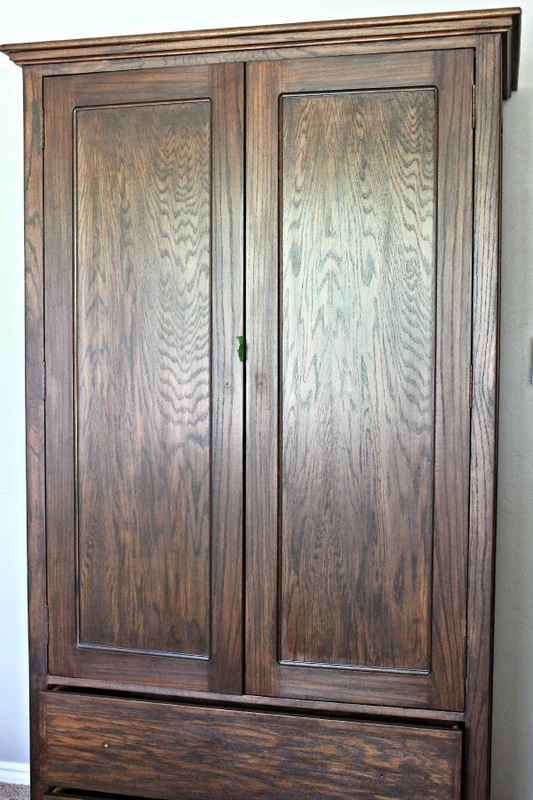 Updating the armoire was my other big project this week. More details later, but remember it had a lighter stain that tended to read orange, as oak does. This was my first time to try a gel stain, and I can say I'm pretty happy with the results! The hardware has really had me stumped on this one. Nothing seemed right. I don't want it to go rustic, but anything too glam didn't seem to work either. I *think* I finally came up with something yesterday, but still need to finalize. Although I measured and cut a few weeks ago, I didn't get around to sewing my drapes until this week. But, I'm happy to say,I finished the drapes late last night! They still need to be hung, but I'm so glad to have that task in particular finished. Sewing drapery panels (115" long and double width) with blackout lining (so hard to work with) is no fun at all! 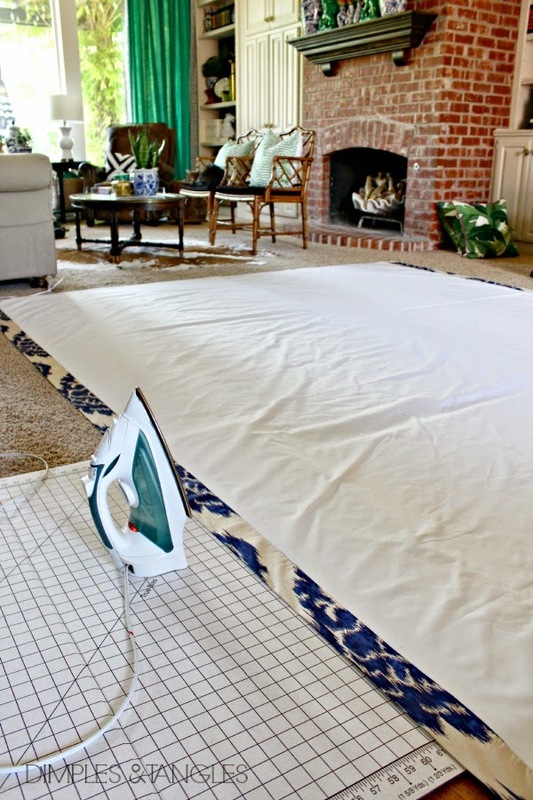 Here's my tip for today... when I'm working with large pieces of fabric on the floor, I use my cutting board under the edges as a make-shift ironing board (just don't leave your iron in one spot for too long on the cardboard). Working with that much fabric and trying to keep all straight and together, it's nearly impossible to get it onto an ironing board. So, I scoot along the floor and do as much as possible all in one spot. Although that big sewing chore is done, I still have plenty of pillows to sew. I've been playing with different possibilities and trying to decide which one I want where. And then thinking about details... which ones need trim? Should I monogram? What size? How many? So many decisions... ;) BTW, that's just the fabric that will be on the headboard thrown up in the back. That's tomorrow's project! I've seriously been keeping an eye out for reasonably priced lamps for this room for months, and have come up empty handed. I can't get to Homegoods very often, but when I did I never found the right thing. This week I noticed these at Hobby Lobby, and I'm going to try them out. Not exactly what I had in mind, but they just might work. I think. getting better, but still lots to mark off in a few short days! Thanks so much for checking in today, be sure to visit the other Linking One Room Challenge participants here! Oh girl, the detail work on your doors is greatness! Love the details on your doors Jennifer and the rug too!!! I think the lamp look perfect! hope it works out! You are completing SO many amazing projects!! It will all look fantastic and I can't wait to see it all come together. We are soul sisters! Ob-sesssed with those doors...are those ceiling mounts I spy? Can't wait to read about it! And omg all of these fabrics have me drooling into my coffee! I so understand how hard it is to work with that much fabric making drapes, but they will look amazing I am sure. The fireplace wall is looking fabulous. Can't wait to see more. P.S. Forgot to tell you how stunning the doors are. Unreal Gorgeous. It's looking good!!! You will have a sister in stress this week. I have sooooooo much to do. I'm head-over-heels in love with those new closet doors! I cannot wait to hear the details!!! Dying to see how this all comes together! Those doors!!!! They look AMAZING! I love them and can't wait to see the finished room! 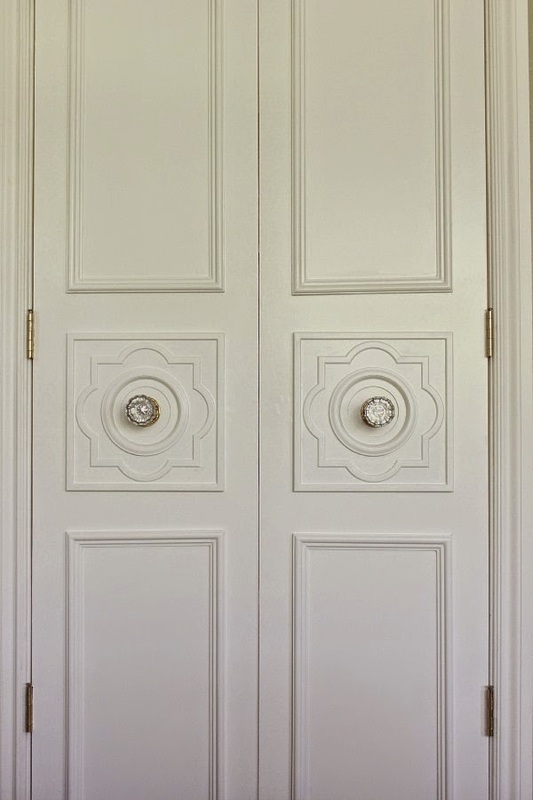 The doors leading into the bathroom are SOOOO gorgeous! I work with large pieces of fabric for my blanket boutique as well and know the difficulty of keeping such large pieces aligned. I'm looking forward to the reveal next week! Can't wait for this reveal Jennifer...I know it's going to be a stunner!! This is going to be so amazing! Those swing arm lamps are so fabulous! Those closet doors are so fabulous, friend!! Love the peek at your new rug, can't wait to see it with all your other patterns, so fun! 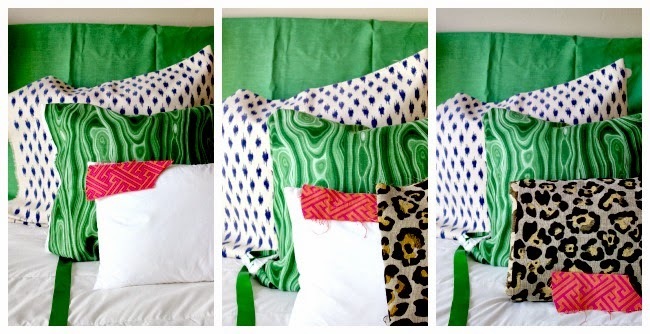 You've done SO many awesome DIYs in here, anxious for next week. Bad photo weather here too, fingers crossed for you! I absolutely LOVE the doors! I can't wait to see the entire room. You've done a great job! Those doors look amazing! Can't wait for next week's reveal! THOSE DOORS!!!!!!!!!!!!! Oh my gosh! I'm blown away. Those doors to your bathroom are fantastic; I can't wait until you share how you did those! Love the wall lamps! Putting that on my master bedroom wish list! Wow, Jennifer! You are such a rockstar. You have gotten so much done already! It looks so fantastic, and those doors are amazing. Good luck this week! I can't wait to see the reveal! Those doors are stunning! The details and the knobs ~ just perfect. I love the swing arm lamps and the rug and the fabrics and.... :) Lots of hard work I know! Have you found any time to sleep? This is going to be so good...can't wait to see the finale!! You've been a busy bee! Those doors are stunning and I really like the lamp. Good luck on your last week! I understand your dread with the curtains. I have one panel left for my bedroom, not for my ORC but I guess I'll have to get back to it when this is done. Love the work you have done here. The details on the doors and the lights are smashing! So looking forward to seeing the completed room! And I love your colorful home. 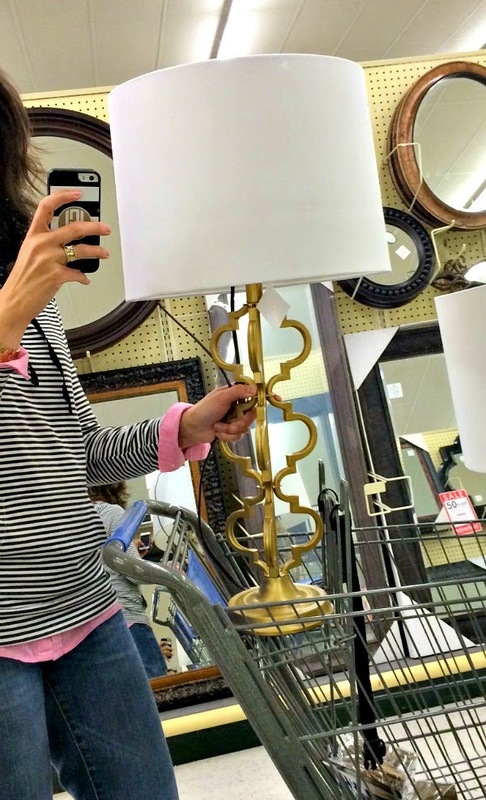 I purchased that same lamp a few weeks ago at HL for 1/2 price. Then I went to a good lamp store in my city and bought a beautiful silk drum shade. That cost more than the lamp but it was so worth it! Completely elevated the look of the lamp! Good luck with the final room details. Everything looks so good. Can't wait to see the finished room! I love everything you've done. Can't wait for the reveal!! Everything is looking good! I can't believe how much you have accomplished in there already! You have been BUSY girl! Everything is looking great and I can't wait to see the reveal! Jennifer, I keep checking back to see the big "reveal!!!" I cannot wait. 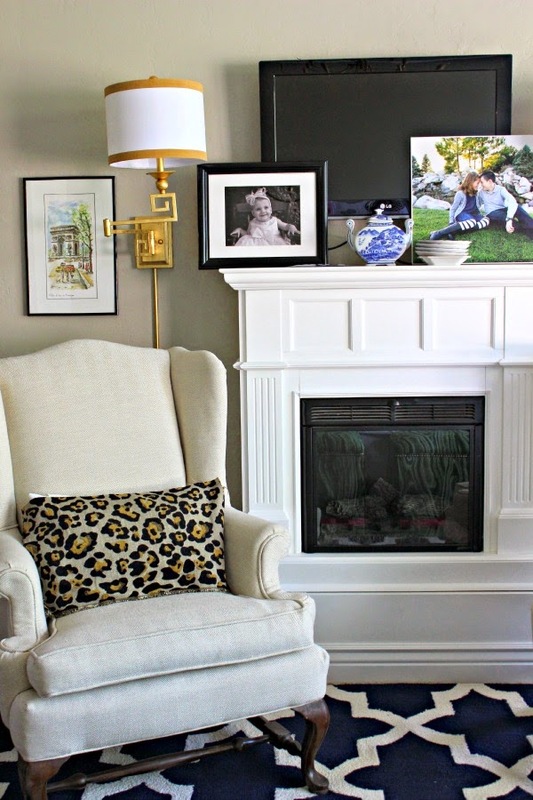 A few ideas I'll be stealing...a DIY fireplace, seating area, adding sconces.... :) So love your style and creativity! Thanks Betsy, today's the day! Where did the fabric for the windows come from? I must have it! Beautiful room!!!! Where did you find the fabric for the ottomans?? I LOVE it!